With the increasing interest in the use of narrative communication as a strategy for influencing health behavior, there has been an effort to develop standardized protocols for creating engaging stories and to determine the successful components of an effective story. Narrative editing (create a narrative that followed dramatic documentary style). Pilot testing (assess usability and dramatic engagement). We are fortunate that research is being conducted on how to develop effective stories. These authors followed this research with another study on how effective their stories were in actually impacting smoking behavior. More on that soon. Bottom line — It’s important that science address these issues; there may be more that we can learn regarding how to be more efficient at creating effective, persuasive stories. In addition, we believe that science will confirm what we have known for millennia, stories are effective at teaching and changing behavior. (Publication style reference) Houston, T., Cherrington, A., et. al. 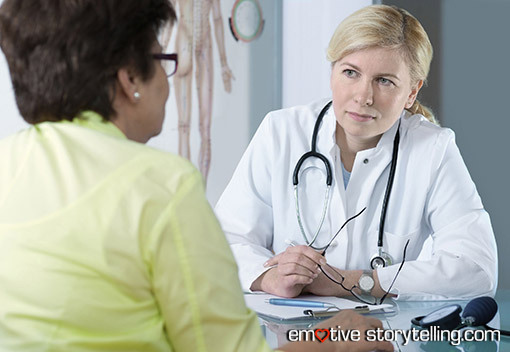 The art and science of patient storytelling– Harnessing narrative communication for behavioral interventions: The ACCE Project. (2011). Journal of Health Communication: International Perspectives, 16, 686-697. Storytelling uses Narrative Communication to drive Behavior Change.